Located at 2334 E Southern Ave, Tempe, Arizona, we are focused on spreading the gospel of Jesus Christ and on edifying His followers. We are a fellowship of believers whose greatest desire is to worship and magnify our Lord Jesus Christ. We gather throughout the week for worship, prayer, Bible study, and fellowship, and we welcome you to come and join us! In 1991, His Church Calvary Tri-City moved to the corner of Price (101 Freeway) and Southern Avenue in Tempe. This convenient location is easy to get to and provides a highly visible property in order to help us serve the Tri-City area and its residents. Pastor John Higgins is the Senior Pastor at His Church, Calvary Chapel Tri-City. 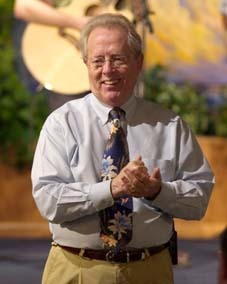 With a sincere concern for the lost, John, being used of the Lord, had a burden for the generation of hippies and surfers, and was used in the Jesus movement of the Holy Spirit that spread from the West Coast to the East Coast, bringing thousands of young people to Jesus Christ back in the 60’s. Today, John’s desire to see the youth of this country come to know the Lord Jesus is still alive in his heart. This summer hundreds of teenagers will meet for a Youth Revival Crusade in Wilsey Kansas. John is also using the internet and radio to spread God’s Word throughout the country. May 17, 2018 Pastor John celebrated 50 years in the ministry. We believe in the inerrant Word of God, therefore, we teach, God’s Word, verse by verse. We believe that the Cross of Jesus is the power of God Therefore, the teachings of this fellowship centers around the cross. We believe that Jesus was delivered to the cross for our transgressions and raised again by our Father for our justification. Therefore, we rejoice in the finished work of salvation by Jesus. We believe that salvation is a gift to us through God’s grace and that the gifts and calling of God are without repentance. Therefore, we rejoice in the security of the believer in Christ. We believe that love is the fruit of the Holy Spirit therefore, we abide under His guidance that we may bear that fruit. We believe that the bodily resurrection of Jesus not only testifies of our atonement but also guarantees that there is a day of Judgement coming upon the whole world therefore, we look for Jesus to come and deliver the church from the wrath to come. We believe in the Lord’s Supper as a remembrance of the finished work of Jesus therefore, we celebrate Lord Supper on the first and third Sundays of each month as we await His return. We believe in the diversities of operations of the Holy Spirit by God. Therefore, we pray after every service, lay hands on and pray for the sick for healing, pray with the unbeliever for salvation and with the backslider for repentance, and for those who are seeking the power to be a witness for Christ we pray of the anointing of the Holy Spirit. We believe that the New Testament teaches us not to neglect the assembling of ourselves together. Therefore, we have an Agape Feast (pot luck) before our evening service thethird Sunday of the month. We believe in prayer therefore, we haveMen’sPrayer on Saturday Morning at 8:00-9:00 a.m. in the Church Office. We also have a Men’s Prayer Saturday nights at 5:00-6:00 p.m. in the Church Office. Ladies also have weekly prayer at the Study on Tuesday mornings beginning at 9 a.m..